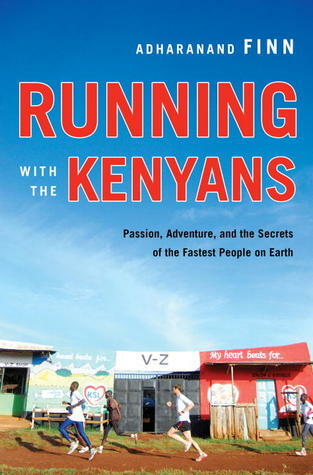 Among the joys of Adharanand Finn’s Running With The Kenyans, a succinct and engaging tale of the author’s experiences long distance running training at high altitude in the East African countryside, is the realization that there aren’t really any secrets to East African running prowess besides constant training, continuous pushing of body boundaries, as well as what I imagine is some kind of awesome capacity to endure the pains that comes with this kind of excruciating endurance exertion. As I read I found myself thinking of that phrase “there’s no there there.” For the runners–no special shoes, no special eating regimen, and even no special precision practice routines and post-run analyses. Just run, rest, eat, and run some more, over and over again. A repetitive monastic running groove, you could call it, powered by a desire for international athletic success. What struck me about this passage was how it conjures a kind of empty mind mindset of those Kenyan runners with their beeping watches which they mostly ignore except as a sonic cue. Without regular recourse to the numbers of pace timings, the runners often use only a sensed bio-feedback from the feeling of what happens (to borrow a phrase from neuroscientist Antonio Damasio’s book) to their moving bodies as guidance. In this sense, the runners seem like really good listeners to the feeling of what they’re doing as they’re doing it. I found this really interesting, both because I sometimes like to measure and time and document things (running included, of course) and because I just as often “zone out” and really have no idea of what I’m doing (while running, obviously, and in many other activities!). In other words, I like precision as a self-imposed game, but often just go by feel. This non-conscious thinking while doing also reminded me of a conversation I had with a composer schoolmate years ago. He had just listened to my performance of a piece I had written for vibraphone and said: “It sounds like you really like the Dorian mode.” I was puzzled because in his question was an assumption that I had consciously known what I was doing when I put the music together, thinking about scales and Dorian modes and whatnot. From my perspective though, I didn’t know what I was doing, but my hands did manage to find things that sounded right, working with the constraints posed by the layout of the vibraphone to narrow down possibilities and then structure the piece around these constraints. Thinking about it now, the layout of the instrument, like the beeping watch for the runners, took the conscious thinking of out the composing process, turning it into a game for the hands. But back to the lessons of running. In sum, I took away from Finn’s book a sense that we might do well to structure some of our activities so that we can take out conscious thinking to better get on with the flow.